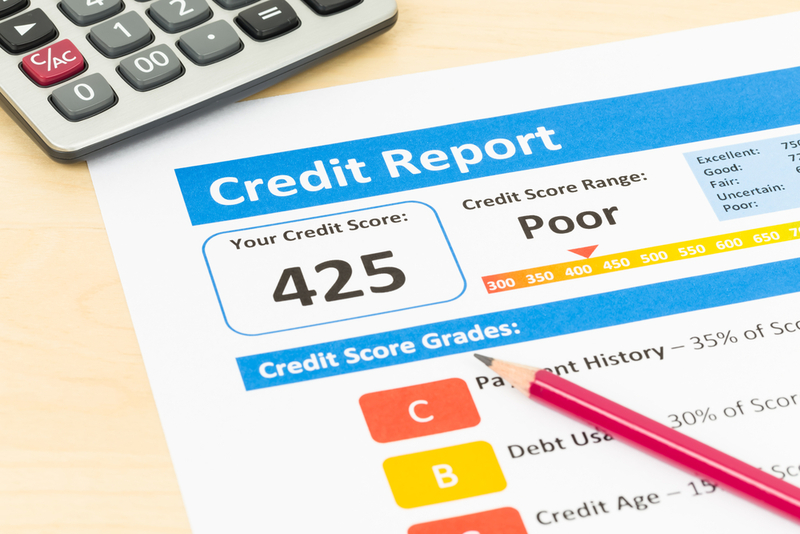 If you have a bad credit score, you probably know it – it makes life hard. Getting an apartment can be difficult, opening new credit cards is a trial, and you may not be able to even get an auto loan – let alone be approved for a mortgage. Bad credit is not uncommon in Canada. As of October 2015, 2.85% of Canadians had a credit score of under 520 – otherwise known as an “extreme” risk rating, and 15% of Canadians had a “bad” credit rating of 520-680. So what causes bad credit? In this article, we’ll take a look at the top 5 causes of bad credit in Canada – some of them may surprise you. Most people know that having credit card debt is bad for your credit. But few people realize that the impact of credit card debt doesn’t just consist of past-due bills – overusing your credit cards and paying mandatory minimum balances can also cause bad credit. Having a lot of money on credit cards is known as having a high “credit utilization”. If you have utilized a very high percentage of all your available credit cards – say, 90% – your credit utilization is increased, and this harms your credit score. This is because a high credit utilization is a sign that, though you may still be making minimum payments, you don’t have the ability to pay down the debt that’s collecting on your cards, making you a credit risk. This goes double if your balances are totally maxed out – your credit utilization will be 100%, and making mandatory minimum payments won’t stop your score from going down. Third-party collections agencies are commonly used by credit card companies if you are overdue in payment but they haven’t yet “charged-off” your account. If your credit card account is sent to a third-party debt collection agency, your credit status will reflect the fact that your credit card company was unable to collect payment from you, and your credit score will be damaged. A credit card charge-off is one of the worst things that can happen to your credit score, barring bankruptcy. This occurs when a credit card company marks you as delinquent with payment, closes your account, and demands payment in full for the debts that you owe. Usually, this happens after 6 months or more of missed payments, and this status will negatively impact your credit score from 3-7 years. Defaulting on a loan is disastrous for your credit score, similar to a credit card charge-off. The issuing loan company declares that you are unlikely to pay your debts, and then demands payment in full for the debts that you owe – even taking legal action, if applicable. This can include auto loans. If you default on an auto loan, the legal action that will be taken is repossession of your vehicle – this can also be devastating to your credit score. The failure to repay an auto loan is typically noted on your credit report for up to 7 years. Filing bankruptcy is, perhaps, the worst thing you can do for your credit score, though sometimes an individual who is deeply in debt has no other choice. Though you may be able to discharge some of your debt, your credit will be decimated, and your credit reports will show your bankruptcy for up to 10 years, which can make rebuilding your credit quite difficult. Now, bankruptcy is quite rare in Canada. In 2015, there were only 63,406 bankruptcies declared, which represented a 2.2% decrease from the previous year. And while bankruptcy is not common, it is the single biggest event that can destroy your credit score – if you had an 800 score before bankruptcy, it would not be unusual to see a sub-500 credit score after you have finished the filing process. Bad Credit? Need A Car? Come To Ride Time! Having bad credit doesn’t make you a bad person or an unreliable customer. You’ve just suffered some unfortunate setbacks – and at Ride Time, we believe in second chances. That’s why we offer the best loans to consumers who have poor credit histories. We can help you get a great quality used car – no matter how bad your credit is. Our unique lending model allows us to partner with 15+ lenders across Canada, and get you a great rate on a used car. If you have had a job for 1 month, make at least $1500/month before deductions, and have a valid driver’s licence, we can guarantee you a loan on a great used car that’s perfect for your needs. So if you have bad credit, don’t worry. Visit Ride Time today, check out our selection of used cars and trucks, and get your life back on track.